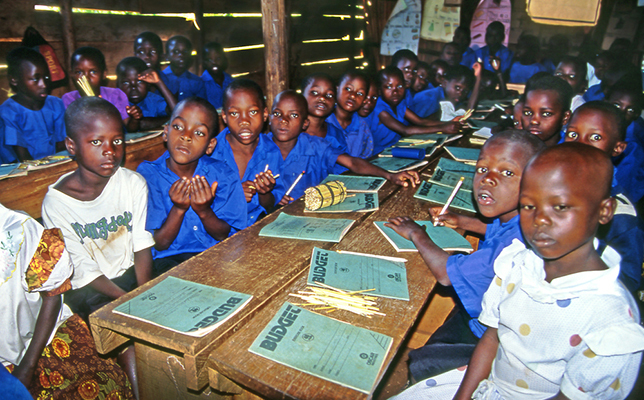 Children at the village school in the Buikwe region of Uganda. Image courtesy of Shutterstock. While the United States is taking a divided stance regarding the use of public funds for private education, families in many countries in the rest of the world that lack ready access to public education struggle to come up with the fees for their children's education, so the kids may not go to school. In Uganda and Nepal, households provide a half of the education funding (57 percent and 49 percent, respectively); in Côte d'Ivoire the coverage is a third (33 percent); and in Vietnam it's 24 percent. These figures come out of a database recently made available by the UNESCO Institute for Statistics, which has committed to increasing the amount of information it makes available. Data users can download more than 3,785 indicators and data from 1970 and onwards. The new UIS Data Centre covers global education statistics related to entry, participation, progression, completion, literacy, financial resources and other subsets of data. The overall goal is to allow people to track UNESCO's progress toward its "Sustainable Development Goals" in numerous areas, including education (goal No. 4). The institute is the official source of international education data, which surfaces in references by the World Bank as well as UNICEF's The State of the World's Children, UNESCO's Global Education Monitoring Report and other official publications. The latest data dump covers expenditure per student by level of education and source of funding (government and households), which exposes the extent to which families shoulder the expenses of education — including tuition, textbooks, uniforms and other costs. Out-of-pocket expenses for families remain high even at the primary level in many countries. In Ghana, households spend about $87 per child in primary education each year; in Côte d'Ivoire it's $151; and in El Salvador it's $680. The concern, according to the institute's researchers, is that such costs can prevent children in the poorest families from going to school. The data suggests that the education expense rises when students head into secondary grade levels. Family spending per student at those levels in Ghana is $228 per year and $637 in Côte d'Ivoire. Households in Africa's Benin spend more per secondary student ($402) than the government ($259). According to the UES, families in many developing countries spend a much higher proportion of their income on education than those in developed countries. Whereas households in almost every "rich" country spend no more than five percent, secondary education amounts to 20 to 25 percent on average in Benin, Chad, Côte d'Ivoire, Guinea and Niger. The database is updated twice yearly. To access the latest statistics, visit the data center here. 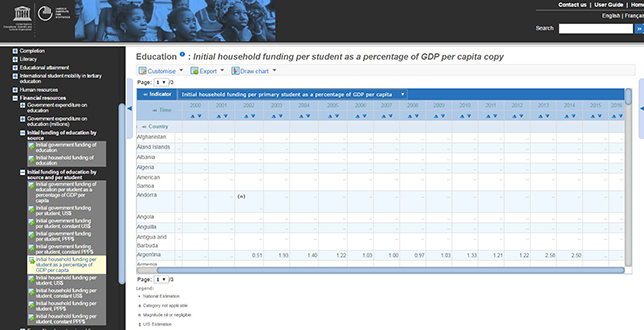 From there, click on "Data by theme," choose "Education," select the data table for viewing and choose "Customise" to specify indicator, country and year.